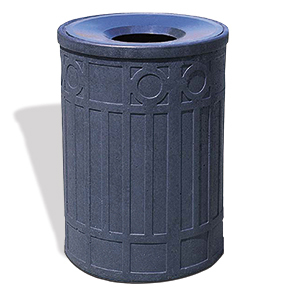 Architecturally distinct this 41 gallon precast concrete receptacle definitely meets function as well as it does form. Commonly installed in architectural streetscapes, stylish design provides landscape accent while promoting proper litter disposal. Keeping areas litter free, clean and inviting. The modern aluminum funnel top comes standard with a security cable, a deterrent to vandals and quite helpful when servicing the unit. Commercial grade steel rebar reinforced concrete's natural sturdiness is built ready to last in all-weather conditions. The aluminum is offered in a variety of colors to match with the concrete base available in selection of ASTM compliant standard and premium finish styles as shown.